Don't think I've shown this pic before. 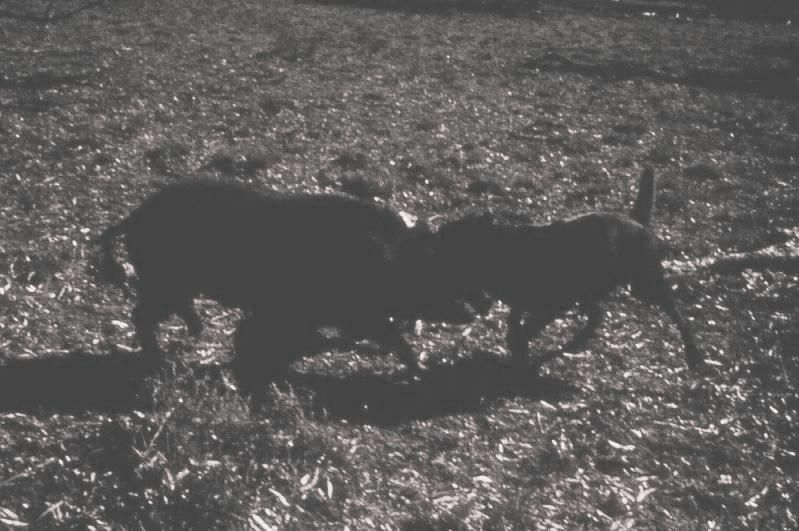 My old dog Trumby with a large boar he caught in the wheat stubble at night, just outside of Moree NSW. He was sporting a fair set of tusks, so I had him mounted. Yeah, it was the taxidermist that mounted him, not me. I can NEVER look a taxidermist in the eye !!! Can't trust anyone that spends all their spare time mounting all manner of critters !! Did you spend in time up around Stewarts Brook at all mate ? Spent a lot of time at Moonan Flat. My mate and I also had an arrangement with the ranger at the tops to hunt pigs with the dogs. Not sure he was supposed to let us in to hunt, but he did. My mate had some arrangement with the ABC, and they filmed my Dingo scaling the Dingo proof fence. I was standing on the other side and whistled him, he just climbed it, and came down the other side like he'd been doing it all his life. I know Moonan Flat and Brook well mate. I also probably know the ranger you are talking about !!! I hunted there as well. Just went for a drive up Stewarts Brook a while ago as I use to hunt there to. I forgot how steep it is...! I was up there three ot more years ago, my wife hadn't seen snow before. We were lucky as they had the road closed to all but full 4×4 wheel drives. We came in from the Gloucester side and out the western end, through the Dingo gate. It is steep, expecially when keeping an eye out for black ice. Been more than a few go over the edge right below the Dingo Gate !! A guy I know but his truck over there and managed just to jump before he went to the bottom with it. Friends also got permission to salvage some parts from a wreaked car at the very bottom below, while looking around for it they found ANOTHER car still containing the remains of the driver. He was a travelling salesman that went missing several years before, he work over on the coast but was suppose to attend somewhere up the valley. No one over considered he would have tried to "short cut" over The Tops so they never searched for him there and he was listed as "missing" till they turned up up there. Generated in 0.021 seconds in which 0.011 seconds were spent on a total of 14 queries. Zlib compression enabled.